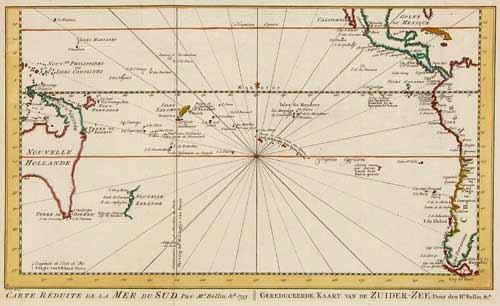 A Dutch edition of Bellin's map of the South Pacific from South America to Eastern Australia, engraved by Schley. Published a decade before Cook's first voyage it hypothesises an unbroken coastline from Tasmania to New Guinea, and marks the partial outline of New Zealand, unvisited for over a century. The map is in very good condition with attractive later colour.